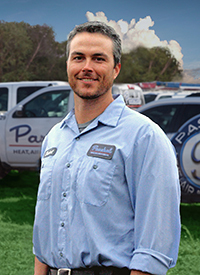 Daniel Minton currently serves Paschal as a Commercial Energy Specialist, with initial company experience as an Installation Assistant since December of 2014. From April of 2011 to November of 2014, Daniel served as a Sales Representative for Zimmer Orthopedics, of Northwest Arkansas, earning three consecutive years in the Million Dollar Growth Club as well as the President’s Club Award in both 2011 and 2012. From September of 2007 to April of 2011, Daniel served as a Sales Representative for DePuy Orthopedics, earning the Top Sales Award in Extremities and finishing first in sales in the South Central Region in both 2009 and 2010. Daniel graduated in 2007 from the University of Arkansas with a Bachelor of Science Degree in Business Administration. Daniel is a member of the Springdale, Bentonville/Bella Vista and Rogers/Lowell Chamber of Commerce. Informing customer of different Trane options for replacing 10 year old Rheem system. Educating customer on different trane HVAC options for replacement. Educating customer on replacing older 12 SEER Lennox equipment with Trane 18 SEER 2-stage Heat pump and Variable speed air handler. Educating a customer on different more efficient HVAC options. Looking at adding a ductless mini-split in an office that isn't keeping up with the customers desired temperatures. Estimating replacing 10 year old single stage system with high efficient zoned trane equipment. Free quote to replace old system with a new Trane system. Estimating replacing old HVAC with new high efficient trane A/c and furnace. Estimating replacing old heat pump and air handler with trane high efficient equipment. Estimating to replace old HVAC for high efficient trane equipment. Estimating to replace HVAC for light commercial building. Estimating new construction geothermal HVAC. Looking at replacing Commercial rooftop package units with Trane RTUs. Quote to replace inefficient HVAC with trane high efficient A/C and Furnace. Estimating to replace heating and air with Trane high efficient A/C and furnace. Estimate to replace an A/C and furnace with new high efficiency Trane equipment. Estimate of cost for a high efficiency HVAC heat pump system and air handler along with complete metal, insulation duct system. Explain air conditioner replacement cost.